Shooting does not start until 9:00 AM and goes till 9:00 PM. Unless there is a League Shoot or ATA Shoot. When these shoots are going on, the fields will be temporarily closed. There is open shooting on all fields on Friday from 6:00 PM till 9:00 PM and is open to the public starting the first Friday in March. Trap shooting with lighting system is allowed until 9pm. Range is open from 9:00 AM to sundown except for club scheduled events. Do not use vehicle headlights on rifle and pistol ranges to shoot after dark. 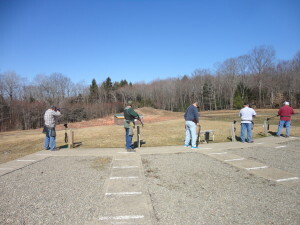 Pond is closed when 100 yard range is in use, especially during an IDPA match. IDPA pistol matches are held the second Saturday of each month, March through October. Setup starts at 8am, new shooter orientation at 9am and match typically runs 10am thru around 1pm. The 100 yard range and all 4 pistol ranges will be closed during IDPA match. Check the calendar for other pistol classes and law enforcement training and qualifying. One or more of the pistol or rifle ranges may be closed for these events. Otherwise, the rifle and pistol ranges are open all week to club members who have a combination to the front gate. We are also open on Tuesday morning at 8:00 am and sometimes on Friday mornings and currently Sunday mornings for trap.